We are living in one of the most exciting times in history; a time of massive paradigm shifts, rapidly changing value structures, and unbelievable possibilities. It is also a time where Great Wisdom is needed to navigate through these changes; a time when both action and calm are needed. Knowledge for a more Sustainable Future must be discovered and communicated in a manner that makes it accessible to those that need it most. As our current Built Environment is one of the largest problems, I am working in my little corner of Suburbia to implement Permaculture while still living in an H.O.A. and will detail my trials and discoveries here, as well as relate resources and articles. I see food production as one of the paradigms most ripe for change, and with some of the biggest benefits to a more sustainable society. Much of my work is centered around sub acre agriculture using low to zero inputs to help add to the growing body of knowledge of growing food on a much more personal scale than is currently experienced in The West. I also dabble in community building, and the ubiquitous Green Living: we are experiencing many problems and must engage in the search for many solutions. Plus backyard farming is really damn fun. I believe in small, personal solutions to the Big Problems of today; I believe in the power of Hope and Community; I believe in the power of each of us to improve our Future. And that belief in the individual is itself a Revolution. I live with my incredible wife and 2 young children in Southern Wisconsin, where I drive my Biodiesel powered VW Golf daily to work for a Fortune 500 Company. I dream of a time when we can live lighter on the land, build healthier communities that do not owe their affluence to the reduction of future generations wealth. Struggling at times to remain balanced between being a father, husband, and employee with my obsessive Moral Imperative to try to Save the World, I try to live my life one day at a time and to end each day having learned a little, laughed a little, and loved a little. I hope you enjoy the site, and hopefully together we can learn how to better Be The Change we wish to see in the world. I have been reading up on worm farming and so me and my oldest decided to give it a try. We are starting small but have hit a few snags. Well actually a big one. I think that our worms are dead. They don’t move much, if at all and do not seem to be eating anything that we put in there. We got our worms from a fishing store and dumped a few cans of them in a bucket with some extra dirt. We then put in some table scraps, popcorn, a banana peel and some coffee grounds. Anyway it has been about a week and the worms do not seem to be eating any of it. Oh yeah the worm bucket is in the garage. thanks. PS love the new site. Great to hear your back from Defending the Free World in one piece! Assuming your garage is not overly warm I would blame temperature for your lazy worms. Under 65 degrees worm’s metabolisms all but shut down. If that doesn’t work I would make sure you are spending time each day saying encouraging things to them. All the disparaging remarks in the English language about “worming your way into things” may be getting to them. Or not. species of earthworms may not be interested in eating your food scraps. climate (San Francisco) where it never gets below freezing. Chris, I love your site! Just came over from Green Bean. You’re on my reader now. Cooter, If you actually see the worms, but they just seem sluggish, make sure that the bedding isn’t too dry. Mine get like that when it’s too dry. Wet sponge consistency is what you want. If they really are dead, it is possible that the banana peel could be the culprit, though, I doubt just one would do it. Unless it was an organic banana, they tend to have A LOT of pesticides sprayed on them. Or at least that’s what I’ve read. Never had a problem with them myself, but ours are mostly organic. PS- We’ve been doing worm composting for 4 years or so and it is definitely worth the effort, even if you have to try again, maybe with better worms like Chris says. I’ve also got a lot of info on it over at my website. I’m thinking about starting to ship out free starter worms if I can figure out how to do it without them dying. Send me a note and I’ll fire off the invite! Chris — this is a great site. I share a lot of your interests and gardening ambitions (although with a much smaller yard, I fear). I’ve signed up for your RSS feed and look forward to reading your posts. Since we have a very similar category/tag clouds you might enjoy my environment-issues-from-a-Californian-Quaker-perspective blog — titled with great imagination: EarthQuaker (www.earthquaker.org). I just came across your site and I think it is great. Excellent philosophy and lots of interesting stuff i look forward to delving into. We made the leap 4 years ago to live a life closer to the land, moving from London to a small farmstead in the Cevennes mountains of South of France. I journal my efforts, on http://www.masdudiable.com, to grow our own food, what I do with it in the kitchen, saving and sharing heirloom seeds and the rural skills needed to live in a dry mountainous region like ours. I’ve just come across your blog and it looks like a real treasure trove. I look forward to digging in to all the useful information you’ve made available here. I’ve just started a blog of my own and your work is a real inspiration. Rob, I am writing an article for a national consumer magazine about food safety and backyard microfarming and I’d love to interview you by phone this week for the story. Please reply to my email if you’re interested. Hope to hear from you. I Love your site. Your enthusiasm is contagious. I was wondering how you manage doing all things you do, (father of 2, day job, farming, saving the world, one straw web site, public speaking), in a 24 hour day. I’m the father of 3 boys and I can only manage a fraction of the things you do. I feel a strong sense of urgency to gain practical skills due to the current crisis our world is in right now and it’s hard to keep from panicking. Any advice on how you are so efficient with your time would be greatly appreciated. The short of it is I don’t -the farm especially is pushing the limits of my time and things are suffering. That is mostly due to it being 5+ miles from the home and the tool storage is here. The longer answer is that I really enjoy doing all those things, and I like being active with Things With a Purpose. Other Big Contributors are that we don’t watch television, and I rarely read fiction other than 30 minutes prior to bed to clear my mind. Figure that the average American watches about 2-3 hours a day and then put that time into speaking, barrel building, and farming and you can begin to see how it can be done. I have never learned anything in enough detail on TV to be useful, but it can be a good starting point to be useful or to point to broader trends. Practical skills are vital and there is no better way to learn than doing. Gardening in particular takes a long time, since learnings from mistakes made cannot be implemented until the next year in many cases. Classes are a good start, but finding teachers in “contrary” skills can be difficult. Reading has proved better for me -I spend the winter devouring books and websites – and then spring and summer implementing and experimenting. The blog is just a public journal so that others can learn along with me – I reference it often for planting dates, pictures, etc from years past. Gene Logdson is a great author and inspiration for me as someone who has the skills, and mindset, to model one’s self after. Don’t panic! There is still time, but it is important to move with purpose. Set a goal -you cannot learn EVERYTHING. I have chosen food production, but we’ll need welders, programmers, lots of electrical technicians, and of course the social skills of the consensus builder and peacemaker will be critical as we move towards a more stressful time that will add much strain to the social fabric at a time when the automobile has weakened it already. It matter less WHAT you do, compared to making the choice to do SOMETHING. Urgency is good – but the energy needs to be channeled to avoid despair. I just wanted to let you know that we featured you as one of our 29 Unique Gardening Blogs. Your blog addresses some great issues that many people have with their own backyard gardening. I would love some feedback about the post. Sorry Rob. I thought your name was matt for some reason. please excuse me. Your blog is really helpful, thank you. I linked to your site, would you add us to your blog roll? We live the eco way since 1990, started green weddings& events in 2005 and I am also a published journalist/writer. Hi Rob, great to see someone living the dream, can I add your site to my links page. Thanks Jason… and of course you can! Hey Rob mate, enjoy the site, I live in most isolated city in world (Perth, Western Australia) and have found inspiration, in what ya do. “if modern agriculture continues to follow the path it’s on now, it’s finished. The food-growing situation may seem to be in good shape today, but that’s just an illusion based on the current availability of petroleum fuels. All the wheat, corn, and other crops that are produced on big American farms may be alive and growing, but they’re not products of real nature or real agriculture. They’re manufactured rather than grown. The earth isn’t producing those things… petroleum is! This is a true fact of all our mass produced foods from Australia to china and europe. We can only do our best, gardening and home produce is great. Keep up good work all of us. Goumi (Elaeagnus multiflora – Thunb.) but I’m in UDSA 5, and it looks like they are only hardy to 6, but you look like you’re in 4. How is that possible? Do you do something to overwinter them? We are 5b here in southern Wisconsin. I planted Elaeagnus Multiflora as well, and it does fine here in a semi protected spot. It’s listed as Z5 from Forest Farm (www.forestfarm.com) were I got it from… ? They are well mulched and protected from north winds by a slight hill. I have yet to have fruit, but its only year 3. Only issue was that the rabbits LOVE the new growth in the winter so fencing is not optional until they are established. Thanks! Once you mentioned that, I found that some cultivars are cold hardy to 5. Oikos Trees by me ( http://oikostreecrops.com/store/product.asp?numRecordPosition=1&P_ID=608&strPageHistory=cat&strKeywords=&SearchFor=&PT_ID=119 ) is out of stock, but next season. I learn alot from your blog, and now I get to try Goumis! I am a final year Industrial Design student at UTS, Sydney and I am conducting research for an assignment. The purpose of this research is to help me acquire the necessary information for a research report into Urban Food Gardening. I hope you will have another tour of your farm as you did last year! I co-facilitate a very young Natural Step study circle in Madison. We are setting up tours of green sites for the summer. We would love to be included in any public tour you may be considering this year. Please keep me in the loop and also let me know if you need a hand with organizing such an event – obviously you have a busy season ahead of you. Rob, I’m happy I’ve found your blog. I live up in Baraboo and Kate Heiber-Cobb has been helping us get our property on a more sustainable footing. We are planning on sheet mulching this week, once the weather turns. I will definately look to your blog for tips and advice. Thanks! I am working on growing biodiesel from algae and developing a system for cold country year round growth. Would you like to combine an experiment with your city sewage and algae growth using your compost for electrical power during winter to grow algae and using the leftover portion after first squeeze for mixing with sludge for gas extraction? Sounds like your city is ready to work with you. I am deeply honored by your comments. For your work in permaculture and healing the planet and your very special gift of the English Translation of Masanobu’s teachings we are all in your debt. my name is Anna Viertel and I am the urban farm coordinator for the near north montessori school in chicago. we are building a sustainable farm and foragable perma area on a 1/4 acre vacant lot near the school, with hoop houses for food production. we have no electricity and no running water, so we are homesteading and designing some cool solutions. i’m really interested in talking with you about your design proposal here and using this blog in some of the curriculum we are designing. but i wasn’t sure how to contact you directly. can you shoot me an email at aviertel@nnms.org if you are interested in talking more. Nice web site and blogs. 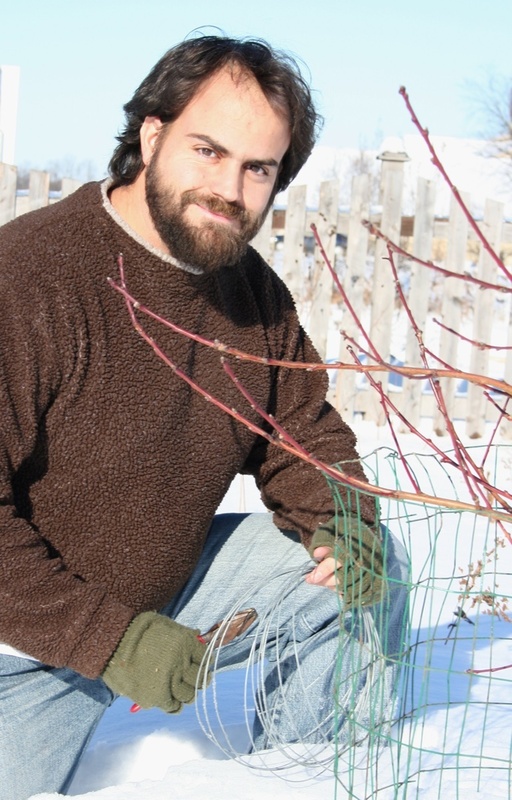 I noticed you are friends with Mark Shepard and the people at MREA and Midwest permaculture. Fine folks all! Check out http://www.onestrawrevolution.net for some photos and articles about Fukuoka-sensei. Hello Rob. I would be very interested in viewing your garden layout plans in PDF if you are up for sharing. I am going to soon be starting my own small farm and would liek some rough ideas. My e-mail is farmforchange@gmail.com if you can share! Mike, if you check the pages sidebar there is a Sustainable Rotation and a Sustainable Garden that go into the basic theory and the latter has a grid payout. What I am up to this Spring is much more involved, with coppice plantings, passive greenhouses, .75 acres of produce gardens, and literally tons of compost -basically more small farm scale. Let me know if you would like to know more about that and I can post something simple. Excellent Blog Rob. Thanks for taking the time to put it out and keep up the wonderful work outside. I am an IT professional with a wife, 2 kids and 2 dogs…out in norther california in a rural area. I work the 40+ grind but have been slowly getting back into the permaculture. I trained with Bill Mollison and Scott Pittman 15 years ago and am hoping this year is the transition to bring it all back into focus after 10 years of just raising kids and working the 9-5. Heres to Mushrooms, worm castings and tasty greens! Thanks again for the inspiration! Keep going and so will we. information and chance to learn more. We are avid gardeners and hope to add small scale poultry to our system. Do you have any experience with this TPS potato seed, these little tiny seeds? I was excited to read about your recent experiments with heating using thermal compost in Midwest Permaculture’s newsletter. I”m a gardener/permaculturalist living in St. Louis. I invited Bill Wilson to teach a workshop here last month. I’ll be traveling to Milwaukee this weekend, June 12 – 13 for a workshop at Growing Power. If you’re available and willing, I would love to see your project and would certtainly be willing to lend you a hand in any further construction. I’ve sketched some drawings of airtubes flowing through hot compost bins to heat underground growing beds in greenhouses, but I now wonder if transfering the heat to water as in a radient floor heating system wouldn’t work better. Your project is an exciting development. Thanks for taking it on. The workshop ends Sunday afternoon around 3:00; perhaps I could come by afterwards, or perhaps Friday evening when I plan to arrive in Milwaukee might be better for you. If this is possible, I would love to see it, if not, I understand you have a family and many other committments. Either way, i’ll be looking forward to your next postings to see how it’s evoloving. Keep up the good work. We’re a eco-surf wear company called Rapanui, based on the Isle of Wight, UK. I’ve come across your blog and thought I’d get in touch: little guys need to look out for each other and all that – I was wondering if you’d be interested in swapping a post for a link, or collaborating in some way. As a small company we need all the help we can get. Let us know if you’re interested in writing a post on Rapanui. We would be really interested to hear what you and your readers think of us as a brand and what we do. I look forward to reading your next updates. Im very interested to see how much methane you get off the midden, the gas expansion from burning that would my tesla turbine very well. The Metropolitan Waterfront Alliance is a non-profit organization that working to revitalize the NY-NJ harbor and waterways. Each year we organize the City of Water Day Festival (www.cityofwaterday.org)—a FREE day of entertainment, education & adventure for the whole family celebrating the potential of our waterfront. This year the event is taking place on Saturday, July 24 from 10am to 4pm. The main festival site in on Governors Island, with additional activities in Liberty State Park (NJ), Brooklyn Bridge Park, and Atlantic Basin. We’d love for you to mention our event if you think it is of interest to your readers. Here is the event description. Or you can just check out the website (www.cityofwaterday.org). A FREE day of entertainment, education & adventure for the whole family celebrating the potential of our waterfront! On Saturday, July 24th thousands from throughout the metropolitan region will make their way to the waterfront for the 3rd annual City of Water Day Festival, presented by Metropolitan Waterfront Alliance. A FREE day of entertainment, education, and adventure for the whole family celebrating the potential of our waterfront, the City of Water Day Festival is held each year on Governors Island and this year features activities in Liberty State Park, Brooklyn Bridge Park, and Atlantic Basin. Festival highlights include: over a dozen fun and free narrated boat tours; special children’s activities like fishing, races, sing-a-longs, arts and crafts, and more; an exciting line-up of local bands; delicious foods from NYC’s best vendors; and more! Please visit http://www.cityofwaterday.org for all of the exciting details. From the upper Hudson to Raritan Bay, we are a City of Water—yet too many of us are cut off from this tremendous resource. Help us revitalize the waterfront with a festival for the entire family. We had this man do a lot of digging in our back yard. He put some type of sheeted material on the hills which had straw interwoven into a light white thread. Should this be left there or should it be taken off after the grass has a good growing time? Hi Mark – the new grass should grow through it and it should be left in place. It is good at reducing erosion, but is a pain to plant through should you ever decide to take it away from lawn. I have been reading your blog and have really enjoyed it so far. As an avid gardener, I always appreciate entertaining, accurate information. I have been doing extra research lately, to prepare for spring in my garden. Since your blog is well-informed and well-followed, I wanted to ask if you would test a product. It’s called John and Bob’s GrowGreen Smart Soil Solutions. It’s a four-part soil amendment system that completely revitalizes all types of soil, eliminating the need for other supplements. It’s an organic system, containing concentrated humus, minerals and live microbes. The live microbes really play a huge role in conditioning and fertilizing the soil. They break apart clay particles, build up sandy soil and provide extra nutrients to plants. The system is really easy to apply. Three products, Maximize, Optimize and Nourish, are dry, granulated ingredients that are simply sprinkled on top of the soil. The fourth, Penetrate, is a liquid fertilizer that is sprayed on. Because they are highly concentrated, they come at a fantastic value to customers. A little goes a long way! John and Bob’s Grow Green Smart Soil Solutions is a unique, integrated system of fertilizer and live microbes that work together to both change the texture of the soil and add vitality, growing stronger, healthier, more productive plants! It’s starting to make a huge difference in my clay-heavy garden. I look forward to hearing back from you. Let me know if you have any questions and if you would like a free sample (enough to treat 1,000 square feet).